Now, I have a confession to make. Yes, it’s true dear H3 readers – a few years ago, while visiting Disneyland, my tech crew were keen to try out one of the roller coasters. I mentioned to them that it might not be a good idea as we had just had breakfast (so you may know where this post is going?). Still, my colleagues insisted, so I hopped aboard and “SWISH” -we were away. I did really well to hold onto my breakfast but it was moving in a vertical motion from all the lateral motion! Anyway, this made me think about the Mathematics of Loops, so here goes! 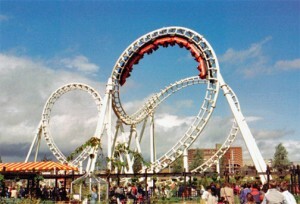 “Many roller coaster these days have loops that are never circular? They seem to have the same similar ‘inverted teardrop’ shape. Why is this? Clearly there is the same physics and mathematics involved in their designs. Let’s take a look and see if we can derive a formula to describe their shape. First of all let’s go back to basics and understand how a loop works. Why doesn’t a coaster fall off the track when it goes inverted? The answer is that there is a force (provided by the rails), that is pushing the trucks of the coaster towards the center of the loop. This force is called the Centripetal Force. 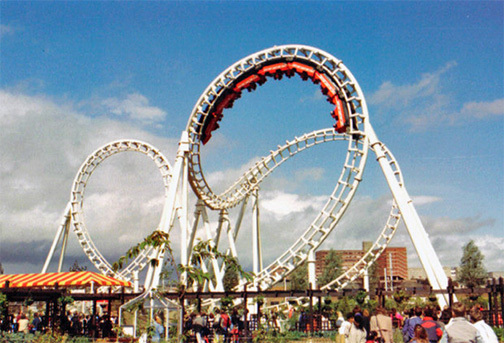 Newton’s first Law of Motion of motion tells us that, without this force, the coaster would like to travel in a straight line and at constant speed. The centripetal force is pushing the coaster around in a circle. It is your body’s (equal and opposite) reaction to this force, often referred to as the Centrifugal Force, that explains the feeling you get of being squashed into your seat (Newton’s third Law of Motion). Using Newton’s second Law, we know that with this Force is an acceleration (we’ll more strictly a rate of change of momentum but, hopefully, the mass of our coaster is constant!) When accelerating around in a circular path, the magnitude of the acceleration is proportional to the ratio of the speed squared over the radius of the curve. The tighter the radius, or the higher the speed, the greater the acceleration. So, the tighter loop gives the trucks the extra speed they need to get over the top of the loop without running out of speed. For the same reason, the loops are not circular if you look down on them – they fan out from a perfect straight, vertical line. 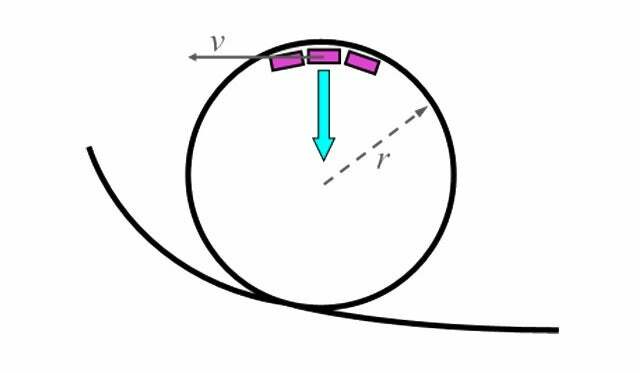 Read more on the amazing mathematics and physics behind roller coaster loops in this Gizmodo article. For another perspective on Newton’s Laws check out this YouTube video.